The third of our World Health Assembly (WHA) blog series showcasing WFSA advocacy work promoting anaesthesia in the global health context. This week World Federation of Societies of Anaesthesiologists (WFSA) officially launched a landmark online resource tool mapping the total number of anaesthesia providers worldwide. A high number of countries reported a total anaesthesia provider number of less than 5 per 100,000 population, highlighting the current crisis in the surgical and anaesthesia workforce that has left 5 billion people without access to safe and affordable anaesthesia and surgical care. The WFSA conducted a global workforce survey during 2015-2016, sending member societies a list of information required and a link to an online survey, as well as collecting information from anaesthesiologists during international conferences and contacting anaesthesia providers working in non-WFSA-member countries. Recent papers have highlighted major discrepancies in the provision of safe anaesthesia and surgery worldwide. The Lancet Commission on Global Surgery estimated that 5 billion of the world’s 7 billion people do not have access to safe, affordable anaesthesia and surgical care when needed. As the essential role of anaesthesia in the provision of surgical care is not always understood by decision makers, the development of anaesthesia has often been given a lower priority than the development of surgery per se in the global health agenda. However, on 22nd May 2015 the World Health Assembly passed the ground-breaking Resolution 68.15 entitled “Strengthening emergency and essential surgical care and anaesthesia as a component of universal health coverage”; a potential game-changer for the 5 billion people without access. 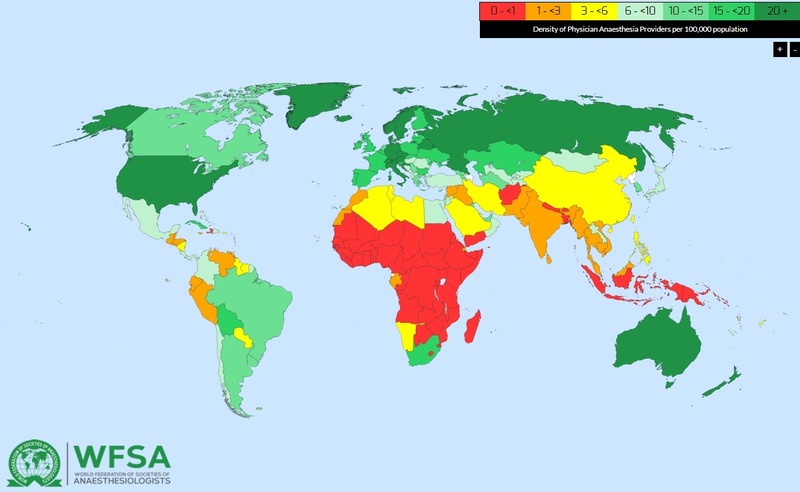 The online resource created by the WFSA, which shows data for countries representing more than 7 billion people, highlights the huge shortage in anaesthesia workforce worldwide and also highlights the gap between the rich and poor and contributes to the global actions that have been undertaken since the 2015 Resolution was made. There is a large difference between the average anaesthesia provider workforce densities in high income countries compared with low income countries. For example, there is a 36-fold difference between the anaesthesia provider workforce density in Germany compared with the Democratic Republic of Congo, and a 50-fold difference between the workforce density in the United States compared with Indonesia, despite comparable population sizes. While the United States has more than 100,000 anaesthesia providers, Indonesia has only 1,950 to serve the whole population of 323.9 million and 258.3 million respectively. Of the countries reporting a total anaesthesia provider number of less than 5 per 100,000 population, none are in the North American or European regions. Instead, most are located in Sub-Saharan Africa, the West Pacific, the Caribbean, Central America and South America, South East Asia, North Africa, the Middle East and West Asia, where many regions and countries face anaesthesia and surgical workforce shortages. “The crisis in anaesthesia is perhaps most apparent in terms of workforce. Safe anaesthesia requires a trained provider and yet across large parts of Sub-Saharan Africa, South-East Asia, and beyond, ratios of far less than 1 trained provider per 100,000 population are commonplace. In high income countries we are used to ratios of 20 per 100,000 or higher, and we experience very low mortality from anaesthesia, yet in low income countries we actually have examples of there being 1,000 times fewer trained providers and 1,000 times higher mortality rates. It’s wrong.” Julian Gore-Booth, WFSA Chief Executive, explained. 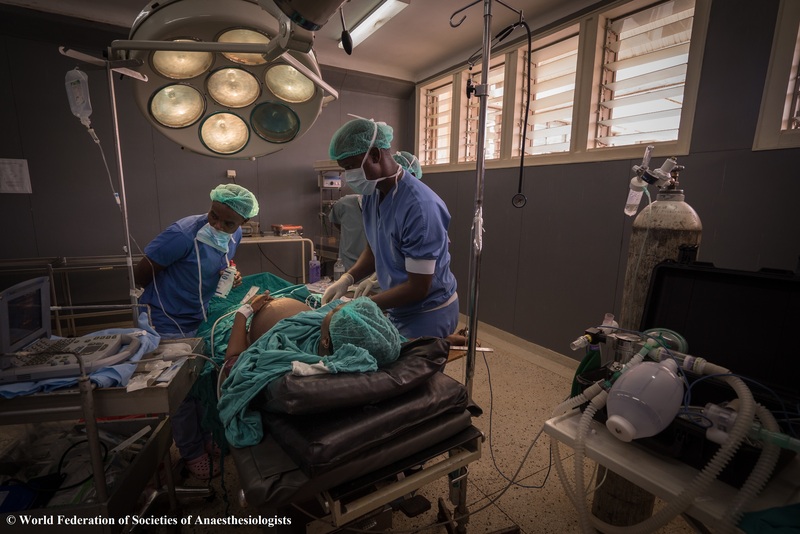 This week the Global Alliance for Surgical, Obstetric, Trauma, and Anaesthesia Care (the G4 Alliance), a coalition of more than 80 member organisations, announced a global unifying target of safe surgical access for 80% of the world by 2030 and has detailed 15 core consensus indicators that will serve as a global dashboard for global progress on achieving this goal. The first two indicators include access to timely essential surgery and specialist surgical workforce density. Surgical workforce density is defined as the number of trained surgeons, anaesthetists, and obstetricians per 100,000 population. Taken with timely access, these two population-level indicators provide an overall measure of the availability of a basic level of surgical care. The WFSA’s Global Anaesthesia Workforce Map therefore contributes to wider efforts to ensure anaesthesia and surgical care is measured, making it easier for the WFSA and organisations like the G4 to advocate for nations to prioritise safe surgical and anaesthesia care as part of their national health priorities, while keeping anaesthesia and surgery in the consciousness of global health policy makers at the World Health Assembly and beyond. The WFSA Workforce Survey is available online at http://www.wfsahq.org/workforce-map and will be updated frequently to reflect new information and corrections.